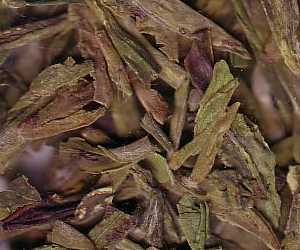 A review of the 2007 Xihu Longjing tea: a Lion Peak (Shifeng) variety from Weng Village of West Lake, Hangzhou. I received this tea from HQ in March 2007. His extended family owns 3 tea gardens in West Lake's Weng village. I have tried various Xihu Longjing before. This is an eye opening experience. It is the real thing! The tea is stored under 3 degree Celsius to keep it fresh. HQ then packed in sealed aluminum bags of 50 grams to send over. 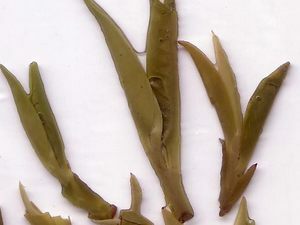 Good Xihu Longjing tea contains about 5% moisture. It should be very brittle, which it is. The most distinctive feature of a Lion Peak is its very strong and chestnutty fragrance. Open the aluminum foil and smell it - yummy! A high grade is straight, flat ,smooth and unbroken. There are many pointed leaves, which is encouraging, as these are the "one bud and two leaves". The color is determined by the type of chlorophyll it contains. 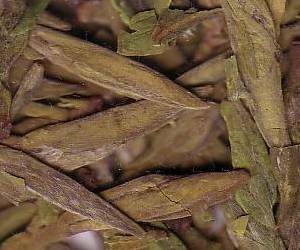 Lion Peak Longjing contains more yellowish than greenish chlorophyll, which makes it appear yellowish green. Unfortunately the scanner makes the picture appears brown rather than yellowish green. You can tell this is not authentic. The leaves are narrow and green. Worryingly, they are fragmented with uneven colors. I am afraid he has been duped. It looks really low grade. Its fragrance pales in comparison with the Tribute Xihu Longjing. It is just too easy to get the wrong tea, even in China. How does the first infusion look like? The glass on the left above shows what happens after 1 minute. The leaves dance around in the hot water. The glass on the right above shows what happens after 5 minutes. Most leaves have settled down, but a large number of them still stand on their ends. I have drunk Longjing tea for many years, but this is the first time I see so many leaves standing. I used 2 grams of tea for 225 milliliters of water, way less than the usual 3 grams for 150 milliliters recommendation. It easily lasts 3 infusions. If you use the traditional "refill two-thirds" method, it lasts 5 infusions! The brewing restores the leaves to their original form. These are unbroken tea flush, very young tea buds with barely opened adjacent leaves. The buds are about the same length as the leaves, which is another sign of high grade. They are great to admire and watch... they hold your attention for a long time. 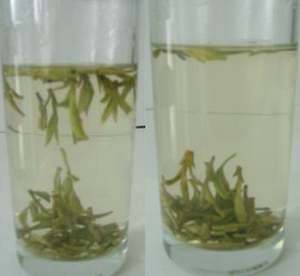 Longjing tea takes 2 months to mature. Being less than 20 days old, this Tribute Longjing tasted more vegetal sweet than floral with a strong and pleasant nutty aroma. What really struck me was the aftertaste. I had 3 glasses in the morning. My palate felt pleasantly sweet and “wet”. This sensation continued to linger on till the afternoon, with still a hint of it by nightfall! It was quite an amazing experience. And as I would find out later, as it matures, this aroma would gradually become more subdued. Its vegetal flavor replaced by an intoxicating floral aroma. It turned from a spirited young man to an enchanting young lady. The Queen has finally come into its own (this is when Danica tasted it)!